Some companies find it challenging to source immigrant talent. Not Cinnzeo Bakeries. The Calgary-based retailer of cinnamon buns meets directly with job candidates through volunteerism, an approach that supports job seekers and the company’s recruitment needs. Hire Immigrants spoke to Graham Dobson, Director of International Retail Operations with Cinnzeo Bakeries about his partnership with the immigrant settlement agency Calgary Catholic Immigration Society (CCIS). Dobson participates in mock interviews to support newcomers in their job search. The practice supports newcomers develop critical interview skills, and is in turn a way for Dobson to source talent, as some mock interviews lead to job offers. Since 2014, Cinnzeo’s parent company, Cinnaroll Bakeries, has hired into retail operations 41 newcomers referred from CCIS, including 15 refugees. That’s a sizeable number for a company of just over 100 direct employees, and a further 100 in its café style bakeries. 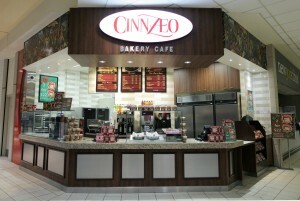 “Two years ago I started with Cinnzeo and was introduced to CCIS here in Calgary. Since then we have established a symbiotic relationship when it comes to interviewing and hiring refugees and immigrants in general. CCIS programs include Language Instructions for Newcomers to Canada (LINC) and employment workshops like Jumpstart to Success (JTS), to name a few. Towards the end of each JTS workshop (about every two or three weeks) I conduct a full day of interviews with those participants interested in experiencing a ‘real’ interview. We use standard interview guides that I developed for CCIS in order for the participants to better prepare for interviews based on Situation, Task, Action, Result (STAR) interviewing criteria. The interviews occur at CCIS whether I am in need of employees or not. At the beginning of every interview I ask them how long they have been in Canada and welcome them to this country with a firm handshake, full eye contact, and a smile. I, literally, sweeten the pot for them by providing a cinnamon roll to each interviewee at the end of the interview. As an ice breaker, there is no comparison. Another ice breaker I use is to tell them that I too am an immigrant, we came across from England in the 60s and settled in Quebec so I am no stranger to the feelings prompted by not understanding the language and culture of their new home. My purpose in conducting these interviews is to observe, listen and make notes, not just on their answers but on all the other signals that they may be unaware of that influence how they are perceived. Most have never experienced North American style interviews and some have never been in close one-on-one proximity to a big, grey-haired white man of authority. The interviews can involve a lot of coaching and guiding, restarting is not uncommon. At the end of each interview I provide some general feedback, and of course, a cinnamon roll. Once all of the interviews are over I debrief with the CCIS Managers and with any of the interviewees that have questions or desire more in depth feedback. My feedback is supportive yet direct and typically follows a ‘Stop, Start and Continue’ format. Anything I respond to, or can see others responding to, is noted and shared, whether positive or negative. This process takes into account the perceived and real biases that exist in the Canadian work hiring environment, not comfortable territory for most HR people but realism is required to support these candidates who can be naïve due to their lack of experience in Canada. As part of the process I also review the resumes vis-à-vis their stated short and long term goals, rewriting or adding information gleaned from the interviews. When I do require employees for my retail bakeries the interviews follow the same format but the stakes, of course, are different. Once again, I provide the feedback to all involved and either hire candidates that same day or tell those not hired exactly what went well and what didn’t. If being involved in an immigrant recruitment program is not deemed of high importance by an organizations’ leadership then those involved in the program may lose the motivation and/or energy level required to maintain momentum and involvement. Because we are small, we can dedicate resources and time differently. The investment of time for these interviews is one that I am cognizant about. Turnover is costly and yet ours has become predictable and we have become flexible in how we cope with staff changes. Our return on investment is high both in staff retention and in sales growth, due, I believe, to the focus brought to bear by these individuals. We have had great success with this approach. The key paradigm shift that continues to support our involvement is on our, Cinnzeo’s, side. We are retail based, the majority of people in general do not work in retail as a long term career choice. Employers in the retail and restaurant sectors have always had the challenge and fought the fight of the cost of turnover of the front line employees. Our paradigm shift was that we accepted that our staff may not be with us past three to six months. The immigrants and refugees that we have hired work with us to achieve certain of their goals; many need to develop and hone their spoken English skills, they all need to establish Canadian work experience, most need to learn the Canadian workplace expectations and a lot must participate in development courses as part of their CCIS program. Many of these new employees are over qualified for the roles they play in our bakeries. They shouldn’t really be with us for longer than eight months if both we and they do our respective parts. Our role is to provide a safe and supportive environment for them to settle into and work within. We have modified the training program in order to allow each individual to learn at a pace that matches their individual abilities. Ironically, the result has been that most complete the basic program after about the same period of time. Some spend more time in customer service using English while sampling, selling and working at the cash register, yet catch on to the hands-on baking component faster. Others find themselves in the reverse situation. One outcome we’ve witnessed is that of heightened empathy in our bakery teams. Many of the immigrants and refugees bring with them memories and sometime physical reminders of awful experiences that result in them reacting at work to triggers from customers or media. Our Managers and Staff are respectful and don’t ask for details but do watch for signs so that we can perhaps suggest that they take a few minutes by themselves to regain composure. Our experience is that, over time, the frequency of these incidences diminishes to almost nil within four weeks as they gain confidence at work and, typically, are having so much fun in the bakeries that they cope better. My personal observation is that the determination to succeed and resilience demonstrated by these CCIS employees strengthens the whole working team. At the end of the day we have found that those hired through CCIS have worked out very well. Most stay about eight months, many move from full time to part time during this time when they attend developmental courses. We have a very open relationship with them, discussions about future plans and timing of looking for a new job that builds toward achieving those plans occur often. This transparency has allowed us to plan our hiring better as well as generating discussions about the process of attaining that new role and how to best manage either their departure from us or their changed relationship with us. We also get to discuss references and what is required within them to support their candidacy and for them to move forward with their lives. I regularly provide references for existing employees that I would rather retain but who should move on. Our Canadian born employees have benefitted to a great degree from our changed approach and the retention numbers of our teenaged staff now defy the industry norms.